With the emergence of the candy bar and cupcakes as modern wedding trends, the only logical next step are entire candy themed weddings. A candy inspired wedding can work for any season, and will appeal to the sweet tooth in all of us. Since candy comes in many shapes, colors, flavors and sizes, you may want to stick to a theme such as peppermint for winter weddings or bright colors for summer events. Another plus is that candy is relatively cheap to decorate with and won't break your budget. Here are some ideas for creating a retro-sweet shop wedding theme. Of course no candy inspired wedding could be without a sweet bar. Fill large glass containers of varying shapes and sizes with a selection of sweets in complimentary colors to create an eye-catching display. Provide paper bags imprinted with your names for guests to fill. Fill a larger vase with inexpensive candy such as conversation hearts or colored marshmallows and inset a smaller vase inside with candy colored flowers. 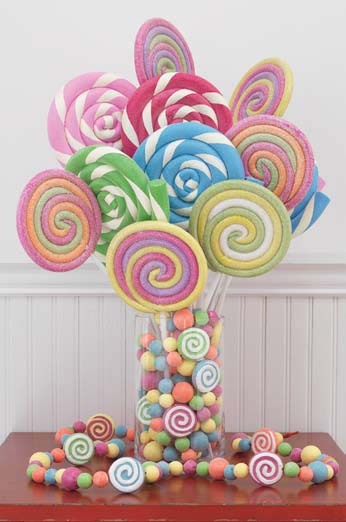 Alternatively, you could purchase mini topiaries and wrap the stems in white satin (to look like a lollipop stick) and attach candy to the branches and cover the soil with candy stones (designed to look like real stones) jelly beans, or other candy. For a DIY idea, Styrofoam balls, silk flowers, candy, wooden craft dowels, ribbon and terra cotta pots can be made into handmade centerpieces. Create table numbers from 5" x 7" cardstock printed off your printer or purchase pre-printed numbers. 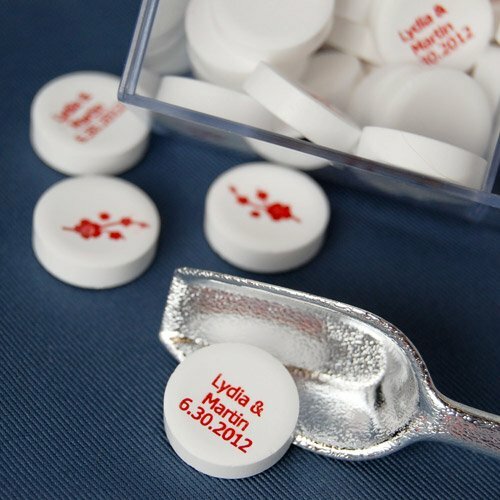 You can then stamp candy inspired designs onto the stock. Attach to dowels, and insert into a tall glass filled with candy. Table decorations - use candy bracelets or necklaces to wrap around linens for napkin rings. Or selectmini candy or cupcake place card holders for a sweet touch. A cupcake tower or your wedding cake designed like your favorite candy, or accented with candy. Imagine a white cake dusted with coconut as snow and topped with peppermint for a winter ouch. Cupcakes and petite fours are also a great touch to your candy theme. Drinks - create a signature candy inspired drink such as cotton candy martini's. Music - play songs such as "I Want Candy", "Lolipop" or "Candy Man" to create a candy driven dance floor. Candy, candy and more candy! Whether you select something modern such as personalized mint tins, something personalized such as chocolate bars, or something traditional such as Jordan almonds, finish off your day with a sweet edible favor.